*Der Mizrachi Veg [The Mizrachi Way: Devoted to the Religion of National Identity] ... 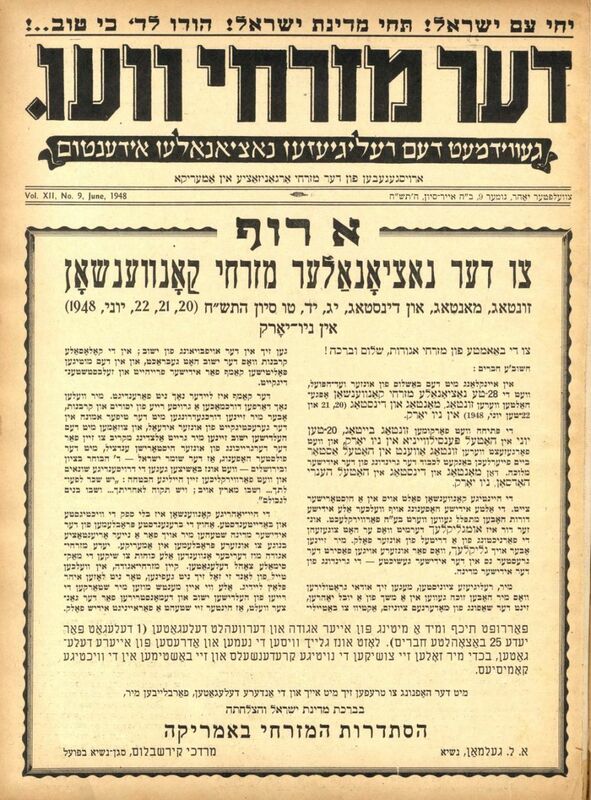 Monthly journal of the Mizrachi movement, published in New York in Yiddish. Published by the Mizrachi Organization in America [מזרחי ארגאניזאציע אין אמעריקא]. Issues from Tishrei-Sivan/ September 1947-June 1948. Includes the special issue published in honor of the establishment of the State, titled "Yichi Am Yisrael ..." ["Long live the Jewish Nation, long live the State of Israel, praise G-d for it is good ..."], with the text of the declaration of independence in Yiddish and many articles regarding the establishment of the Jewish state. The title page is decorated with a special border and includes a special address from the president of the organization, A. L. Gelman, to all Mizrachi societies in New York regarding the good news of the establishment of the State of Israel. * Der Mizrachi Veg - Volume with issues from September 1959-June 1960. * The Mizrachi Outlook - Journal of the Mizrachi movement in America - English. February 1950-June 1951. Brittle paper, tears in some leaves. Three volumes with dozens of issues. Fine condition.